Best Brothers Group of Companies - Automatic doors specialist > Global Security > Do Fake Security Cameras Work? Security cameras are one of the main components of an effective security system, both monitoring your property and deterring potential intruders. Burglars are less likely to attempt to break-in if security cameras are visible but installing a security system includes a cost – one-time or monthly – depending on the system you choose. The associated costs have led some people to use fake or decoy security cameras as a visible deterrent, without the price tag that comes with the functionality of a real, working video security camera. However, this begs the question, do fake security cameras work? Our security experts answer this question and explain the benefits and drawbacks of fake security cameras to determine whether or not they are the right choice for you. 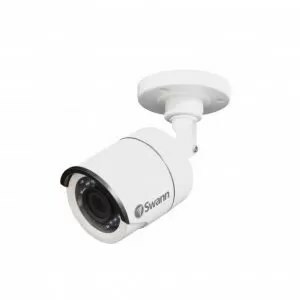 Price – They are often much cheaper than actual security cameras. Purchasing a fake surveillance camera requires much less investment than a fully functioning security system. They may deter some criminals. Installing fake security cameras in your property may stop some criminals more so than if there were no visible cameras on the property. Security stickers and yard stakes can also help deter intruders. They are simple and easy to install. Since the cameras are non-functional, there is no need for wiring and cabling. Generally, fake security cameras merely need to be mounted into place. They are often easy to detect as fake. Dummy cameras may be capable of deceiving a novice burglar, but to a trained eye, they are often easy to detect. Many fake security cameras include a blinking red light that is rarely present on real security cameras. Burglars will use these details to determine that the security cameras are decoys, which may further encourage them to break-in to your property since the presence of fake security cameras may mean there is not a working security system in place. They are useless in the event of an actual break-in. If someone does break into your home or business, fake security cameras will provide no footage to help law enforcement locate the criminals. They create a false sense of security. Whether you install dummy security cameras at your business or home, they can make employees or residents feel safe this is not the case. For companies, this can also have legal implications if clients or tenants feel misled. They do not provide peace of mind. One of the most beneficial aspects of a real security system is the peace of mind that it gives knowing your property is monitored. Fake security cameras offer no peace of mind and will leave you wondering if your property is truly safe and secure. So, are fake security cameras effective? Fake cameras, in combination with security stickers, are better than nothing. However, if your budget allows we believe it’s worth spending more for a real security system. Advances in DIY security technology means that installing a security system is now much more accessible and affordable. Additionally, you don’t need to opt for a security solution with professional installation and 24/7 monitoring which often cause the prices to skyrocket. Instead, choose a customizable DIY security solution to fit your property size, needs, and budget. Invest in a quality security system that will give you the peace of mind and the security you need. While it may have a higher upfront cost, it’s one less thing to worry about. Furthermore, the cost to proactively install a security system is far less than the average amount lost from a burglary. In 2016 the average burglar got away with approximately $2,361.1 In comparison, DIY security options start at a one-time cost around one to two hundred dollars. With these numbers, installing a security system is worth the cost. An interesting approach some people use is installing a combination of real and fake security cameras. In addition to installing the actual security cameras at your entry and exit points, you can bolster the appearance of your security system with supplemental fake security cameras. However, remember the dummy or decoy security cameras provide no value other than increasing the presence of your security system as a visual deterrent. At the end of the day, choosing the best security solution depends on your property and budget. There are options for all property sizes and security needs ranging from stand-alone wire-free security cameras to multi-camera security systems. To help you assess your property vulnerabilities start with a simple security checklist. 1 FBI Crime in the United States, 2016. Security cameras are one of the main components of an effective security system, both monitoring your property and deterring potential intruders.